Want something unique and fun for your First Dance? We have been working with wedding couples for nearly a decade and each couple has their own individual ideas and their own style which we love to develop. The First Dance is supposed to be fun and easy going but for some it can be really intimidating and awkward whilst others see it as an opportunity to put on a show. Whether you think you have two left feet or you think you belong on Stricty Come Dancing then we can help put together the right routine for you. If you want something extra special, allow us to choreograph your First Dance. 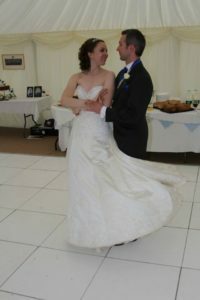 Come and chat to us about what you have in mind and we’ll put together the perfect First Dance especially for you. Whether you want something romantic or completely outrageous let us know and see if we can turn your ideas into a reality. CLICK HERE FOR MORE DETAILS AND OUR PRIVATE CLASS PRICE LIST. Maybe coming to classes isn’t for you but you’d still like to learn a routine so you don’t end up doing the awkward shuffle around the dance floor, we have a solution for you too! We are now offering online courses where you can learn a simple routine in the comfort of your own home. 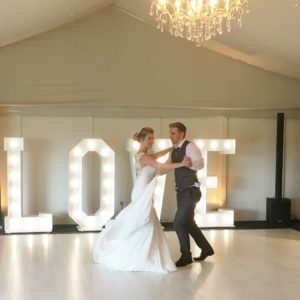 The video series and instruction books allow you to pick up the basics and have a routine that will help you feel confident and relaxed when it comes to your First Dance. CLICK HERE FOR MORE INFORMATION ABOUT OUR ONLINE FIRST DANCE COURSES.